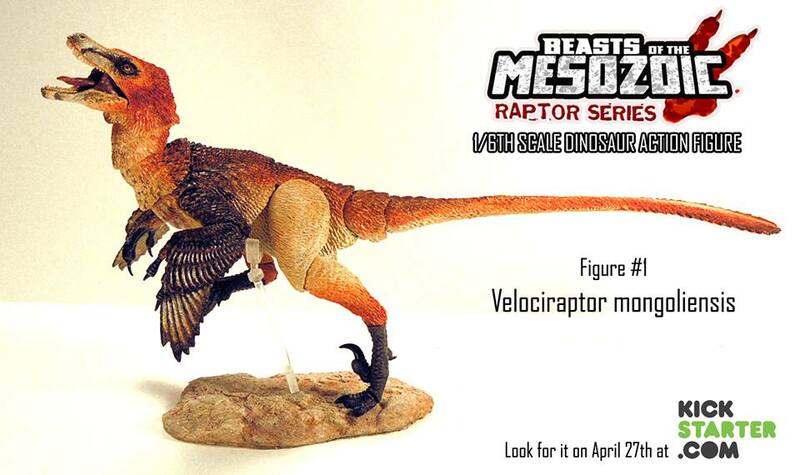 So Creative Beasts' David Silva has been showing off the prototype of his Beasts of the Mesozoic line. Here's an album of its creation, and a video of him putting one together. There will be a kickstarter starting in April as well to fund this line of figures. 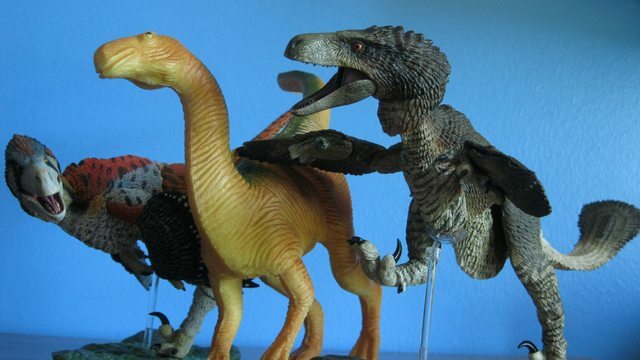 I've been dying for some one to do some articulated dinosaurs, and confused as to why no one has done it yet. So this REALLY hits an itch for me. 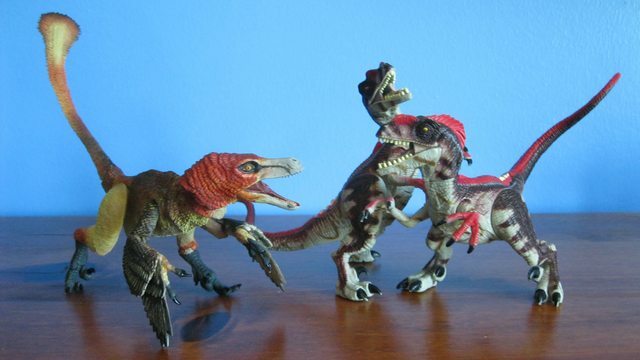 I still kind of hope some one does a JP line of figures, as to me those designs are what dinosaurs are to me. 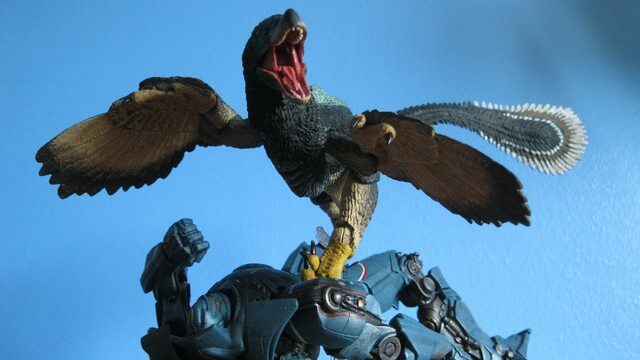 But I'll be glad to have this fine feathered friend on my shelf. I can't wait to to see these models come on the shelves, even if I won't be able to afford them. David Silva is looking at these figures costing $30-40, which I think is pretty good for their size and sculpt. Creative Beast Studio (David Silva) wrote: I have been running this page for sometime now and my focus has always been on my work as Creative Beast Studio, consisting of model kits, concept designs, and other related items. All of what I post here is my own work, non-commissioned and self funded. But what I rarely ever discuss here is my main line of work. The work that funds and informs everything I do for Creative Beast Studio- my sculpting and design work for the toy industry. I only keep the two separate so as not use the popularity of the toy projects and licensed characters as a crutch to promote my personal work. I've always believed that my personal work should stand on it's own merit. That being said, I owe so much to my experiences working in such an inspiring and creative industry developing my skills far beyond what I ever thought possible when I exited art school. 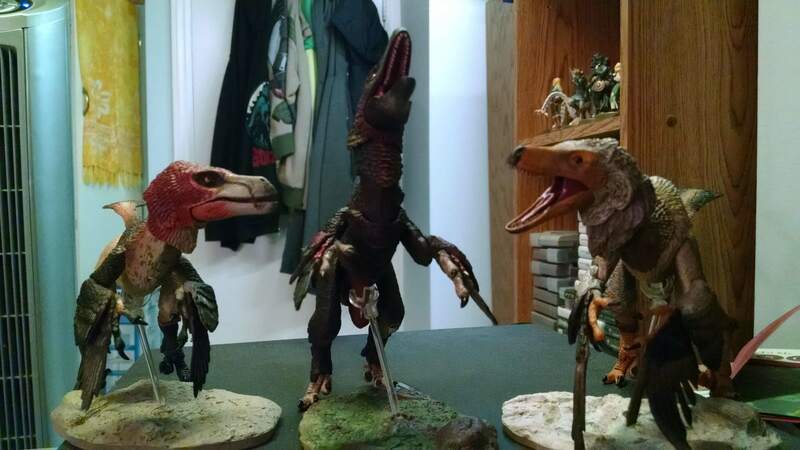 So for this one post, I wanted to pay homage to my time in the toy industry thus far by gathering some of my favorite creatures of which I had the pleasure to sculpt, into one photo with what could be my very first Creative Beast Studio action figure- the 1/6 Velociraptor. I've been doing this since 2005, but I feel like I'm just getting started. A part of me just wants to plop down $100 for one of each but that wouldn't necessarily be the most financially sound idea when I'm trying to save up a bigger expense. Still I might do it. This is the first Kickstarter I've ever seen where i actually wish I could sign up. But I don't currently have the expendable income. :-/ hopefully this gets funded and he's able to produce a whole line of dinosaurs. I just hope that this shows toy companies that people want good dinosaur toys. Well, the BackerKit pre-orders, which got extended twice, finally closed yesterday. I'm looking forward to receiving mine in May! The Backerkit store is open again - and now the line is available at Big Bad Toy Store too!! ...And here's a tease for the next series! After two years, they finally arrived! And I have a fourth ordered coming later this month too. How did I forget about this thread?? 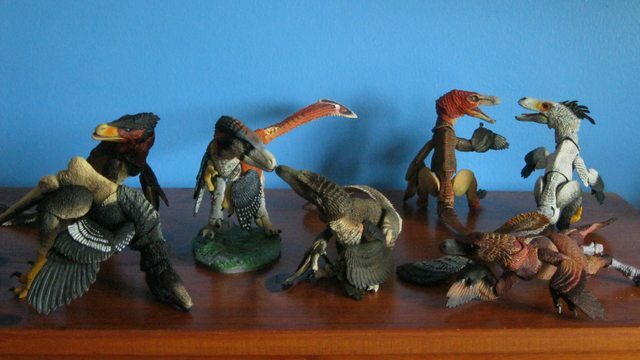 I ended up ordering seven raptors in total - Velociraptor, Saurornitholestes, Dromaeosaurus, Pyroraptor, Balaur, Dromaeosaurus (fans' choice), and Zhenyuanlong (fans' choice). 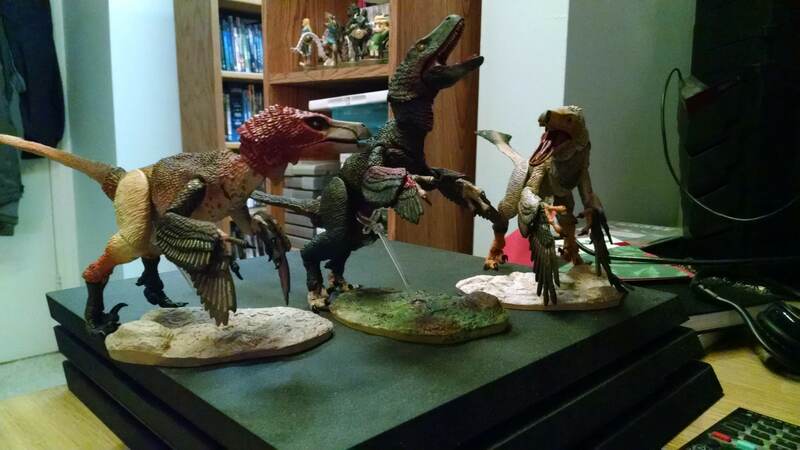 The two Dromaeosaurs and Balaur ended up being my favorites, at least aesthetically (I expected that of Dromaeo, but Balaur surprised me). To be perfectly honest, they ain't perfect; the raptors are very top-heavy and struggle with balance. Some joints are too loose (ankles), and some joints are hindered by the sculpt itself (necks, shoulders). 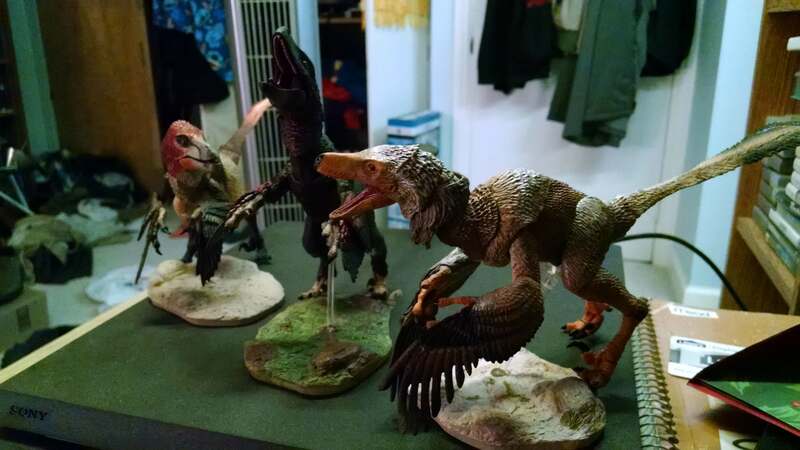 The bases and extra toes are nice, but the actual support rods and pieces are tricky to work with, and prone to stress damage if a raptor falls over too much. Meanwhile, David Silva is hard at work on the Ceratopsian series; he's aiming for an early 2019 start for the Kickstarter campaign. He's making good progress! ^Fully painted Xenoceratops prototype with Atrociraptor for comparison. Look at the size of that thing! !